A vintage band for your Heuer chrono at a price that won't break the bank. Full perforations with that "perfect" textured leather. Available matched with a Heuer buckle. Black bands shown are sold out. Don't miss the last in the chestnut color. 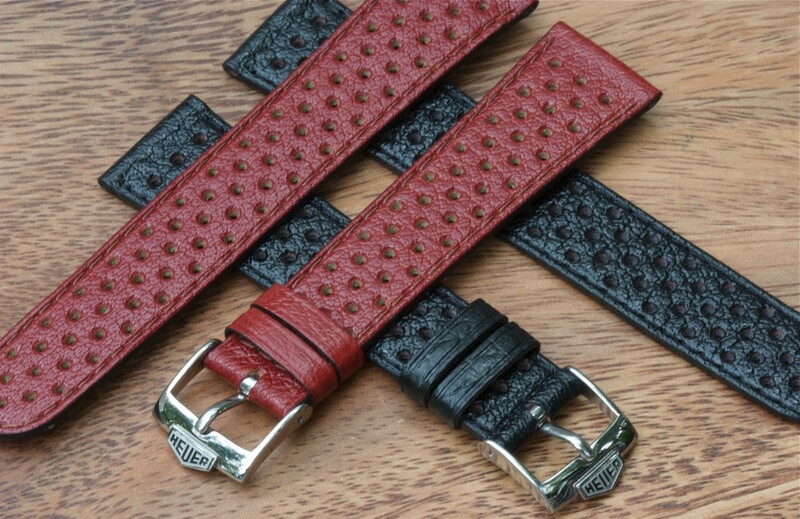 New Old Stock vintage 1960s/70s fully perforated leather 20mm rally straps with a texture that looks similar to the original Heuer Corfam bands that Heuer chronos came on in the 1960s/70s. 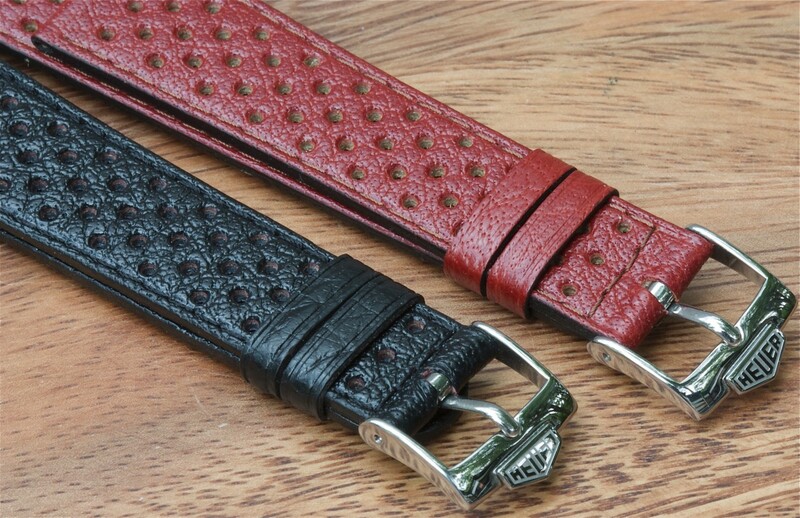 Available in 20mm only in the reddish tan (black bands are sold out). This is a vintage period leather band from that era. Has the same dimpled texture and similar full perforations throughout the length of the strap as the small holes style Heuer Corfam bands. Can come with a stainless steel Heuer buckle installed. 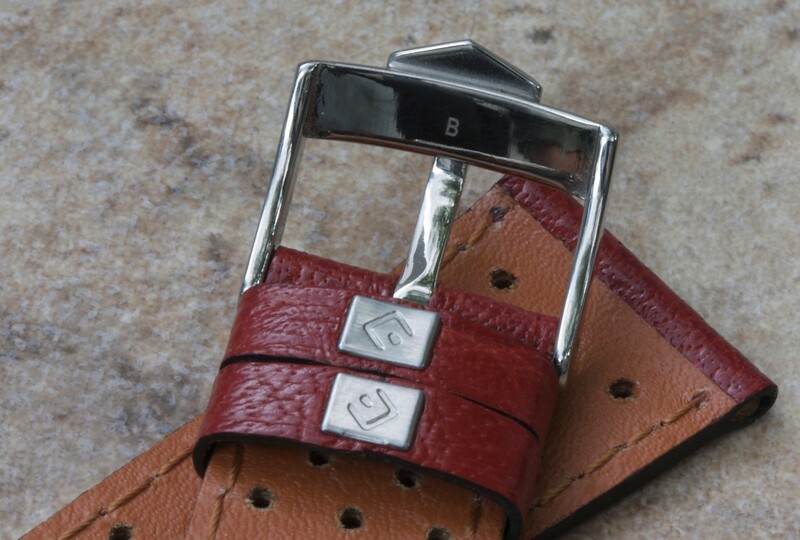 Authentic Heuer buckle is stamped with the “B” on the back. The 16mm opening buckle is an authentic reissue buckle made in the last 20 years. 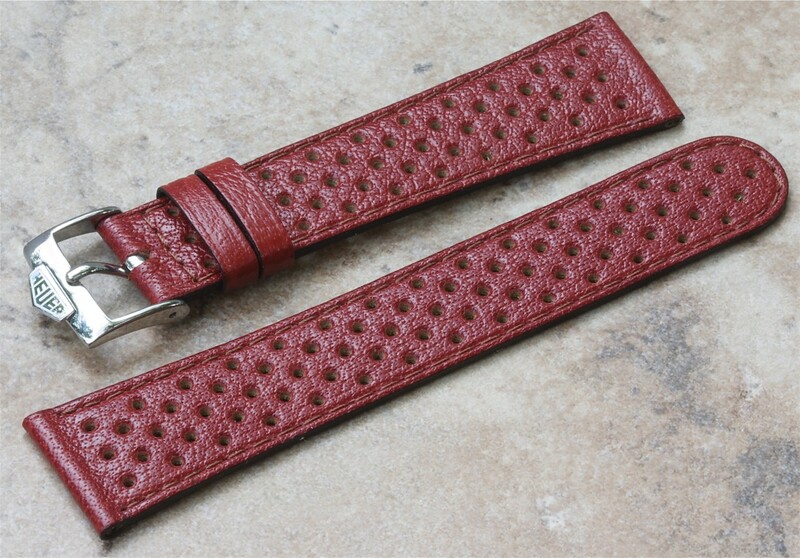 Standard length strap measures 7 1/2 inches (19cm) placed end to end, not including the buckle. Strap is unpadded flat type that is 2.6mm thick where it meets the watch and 1.9mm thick at the tail end. Leather is very supple, fully stitched and very comfortable. The flat design doesn't detract from the watch the way some heavily padded bands do. Great band to wear or help you sell a Heuer watch. $195 with a HEUER buckle included (+$6.99 U.S. shipping or international buyers add $40 for Registered shipping with tracking or $70 with Express shipping. Paypal to billmahoney@aol.com or mail payments accepted. I have many references here. 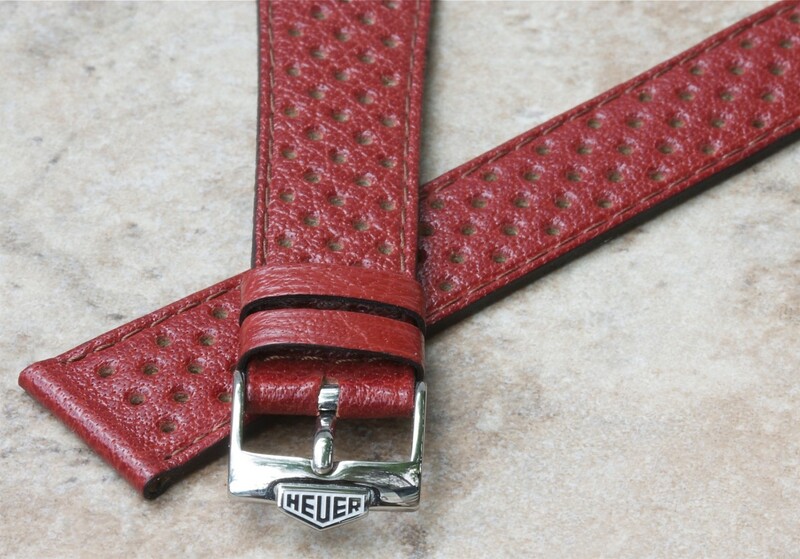 There are many more colors and styles of vintage rally bands in the Heuer section at Squinky.com including the original Heuer Corfam 20mm and 22mm bands, plus others in the Leather Racing Straps section.